Saturday night, at Wembley Arena, London , England , Hennessy Sports presented a thrilling night of boxing which headlined two Title bouts. This was to be Lightening Lenny Daws’ third defence of the title. 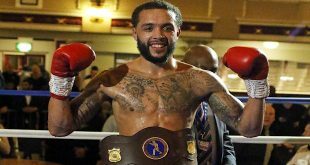 He got off to the better start in the first round with Theophane throwing some wild swinging shots but the Kilburn boxer began to settle in by the second frame and the contest develops in to a slug-fest. Theophane’s trademark seemed to be in taking a neat side step to the left and releasing a quick uppercut which worked a treat. Daws is getting frustrated and forces Theophane back with his head in the eighth. Referee Howard Foster warns him for it and when he offers his glove as an apology to Theophane – it was ignored. Daws has to ‘pay’ for it in the ninth – ending up on the canvas twice in this round. Amazingly, he keeps going, making it till the end of the contest. 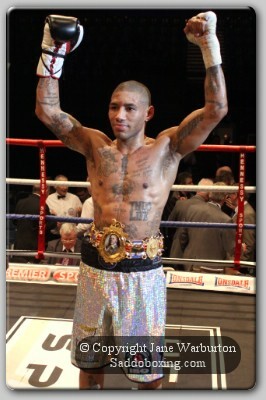 ‘Treasure’ Theophane wins the contest on points to take the title. His record now stands at 29 wins (7 by KO) 4 losses and 1 draw, while Daws drops to 21 wins (9 by KO) 2 losses and 2 draws. Another thrilling contest saw Craig Watson out-point Irish-born O’Donnell. When the two met in 2009, it was O’Donnell who got the points win on a split-decision, this time – Watson made sure there was no doubt. Seeing Watson Saturday night made me realise how much he’d matured as a boxer – as I remembered some of the earlier fights I’d seen him in. It was indeed a great fight between these two. ‘Whooping’ with delight as he landed shots, Watson seemed the more confident of the two men. Shooting out the right to the head of O’Donnell who’s right eye began to swell uncomfortably in the last couple of rounds. But O’Donnell landed many shots of his own. Landing with lefts and rights to the head of Watson, O’Donnell picked it up around the seventh. Watson gets the unanimous points decision to win the title. His record now stands at 20 wins (8 by KO) 3 losses (1 by KO). 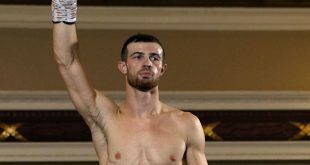 O’Donnell drops to 24 wins (11 by KO) 2 losses (1 by KO). 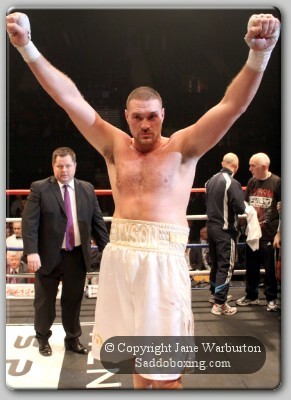 Nascimento suffered his first defeat against Manchester ‘Giant’ – Tyson Fury. The Brazilian went down in the first round and did well to come back from it. He took some heavy blows in the fourth and was knocked out in the fifth – requiring medical attention. Fury improves to 14 wins (10 by KO) no losses, while Nascimento drops to 13 wins (11 by KO) 1 loss (1 by KO). Chris ‘the flash’ Evangleou got more than he bargained for when he faced experienced Nesbitt. Nesbitt was clearly frustrated against the flashy Enfield boxer and seemed determined to land a big right. A close contest with Evangelou eeking out a points victory, with Nesbitt visibly unhappy at the decision. Evangelou improves to 6 wins (1 by KO) while a disgruntled Nesbitt drops to 9 wins (6 by KO) 122 losses (11 by KO) and 2 draws. An over-confident Fury didn’t have an easy start against ‘come-for-it’ Warburton, but a bad cut to Warburton’s left brow in the third forced the stoppage (points 20-18). Debutant - Andreas ‘the Ace’ Evangelou had a tough first contest against Meikle, who gave Evangelou a good contest. 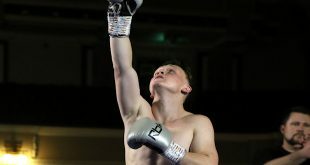 The Enfield boxer seemed to tire quickly and was apologetic towards his opponent, but secured the points win to give Meikle his second loss. Goodjohn wins on points over Seawright and improves to 3 wins (1 by KO) no losses while Seawright drops to 3 wins 40 losses (8 by KO) and 2 draws. John ‘The Gorilla’ Ryder won on points over Byrne. 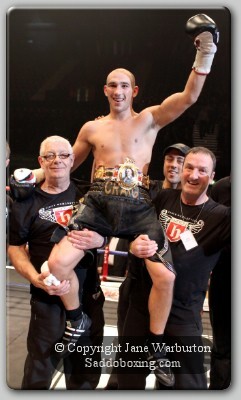 He improves to 3 wins (1 by KO) while Byrne drops to 2 wins (1 by KO) 11 losses (5 by KO). Also, that night, Junior ‘The Hitter’ Witter was in Canada making his comeback after an eighteen month break. 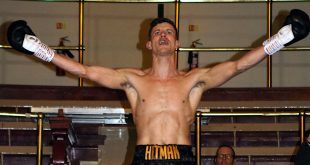 He challenged Romanian born Victor Puiu (now of Canada) for the vacant WBC International Silver Welterweight Title, but the Ingles Boxer from Sheffield lost on a Unanimous Points Decision.